The monthly review features stats for work-outs, an up-to-date goals assessment and a fun little meme. If you missed it, you can read January here and February here. I was injured and ate a lot in March, so no need for a review there! And if you don’t care, that is cool too. I am a Type-A numbers person so this is mostly for my own good. Current Read: New RW came in the mail yesterday! Current Drink: Coffee, Iced Tea and Water. Not a whole lot else. Current Song: Over by Drake. I jam out to that like the white girl I am! Current Wish-List: A place to use my bike trainer…I am starting to think it will be on my front lawn! Current Triumph: I’m running again!!!! Current Goal: A 5k on May 15, would like to finish in 12/minutes miles. Amazing how goals change given circumstances. Current Blessing: Some days, I think everything is a blessing. Current Excitement: Phillies game on Cinco De Mayo!! When I think of my hip flexor and what a huge deal it was/is, and how hard it has been to work my way back to where I am, I think of all those who have come back from so much more. It puts everything into perspective and I am able to quickly refocus. Here are a few people that come to mind: April Holmes (she is from NJ, her accident happened right down the street my my college), The Hoyts (seeing them run at Shamrock was a life highlight), Scott Rigsby, Jim McLaren (these two guys have the worst luck, and each went through their own personal hell but they came back and they did it with the best attitudes). Click their names to read about their amazing and inspirational stories. It isn’t how you get it done…it is about having done it! 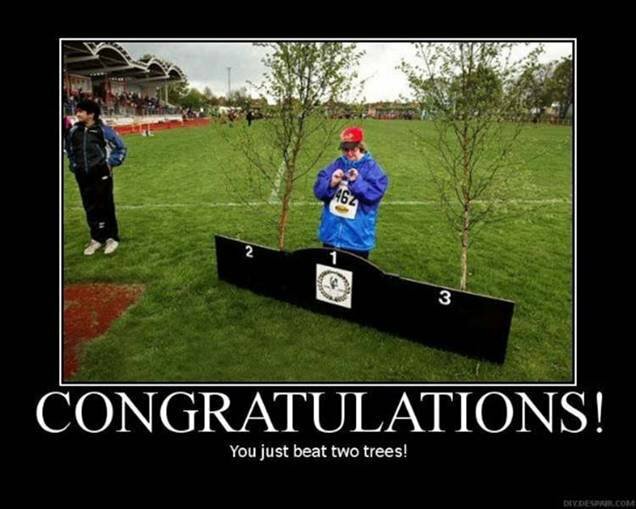 Seriously though…Finishing really is Winning!! 2. I have only three more PT sessions before I “graduate” and even though I am so thankful that I had so much help getting better…I cannot wait for it to be over. PT is an hour from my work, it lasts for an hour and is a half hour from where I live. I am looking forward to having five hours a week back! Every Monday, I will post a question. The questions will be set up to post for @ 6am E.S.T. to give everyone ample amount of time to post their own answers throughout the day. If you want to play along, all you have to do is post the question and your answer on your own blog. You can play along any day of the week that works best for you. Link your post to my blog so that I know you have participated, and in the following weeks post, I will link all the participant blogs from the prior week. Question: Do your family and friends know about your blog? If so, what do they think of it? If not, why haven’t you told them? When I first started my blog, I only told my mom and a few close friends. Then, after a while I put the link on my facebook. Outside of the people I have told and those who use my link, I really don’t know who is reading. Sometimes I talk about my blog but I don’t really promote my blog outside of that single link. I know a lot of people lurk my blog, and of course I wish I knew who they were, but if they want to secretly read than I guess I am flattered. There is something about having my whole life out there that makes me feel a little vulnerable, but my blog truly is who I am so I never had anything to hide. Of course there are times when I wish I could be totally honest but I am aware of those who read my blog, so at times I do censor myself. But who I am here, is who I am. And anyone who knows me in “real life” can back that up. Overall, I am happy with my decision to make my blog public because it gives people who know me a chance to perhaps see a different side of me. Those who I know read my blog have given me good feedback. A lot of people don’t understand this lifestyle and I think this might give them a glimpse into the life I live. Running- 2.3 miles @ 13:03 pace Saturday. Good run…did more running than walking, a step in the right direction. Hoping to run 2.5 this week under thirteen minute pace. Biking- 8.3 miles on the stationary bike Saturday. Still not allowed to do any spinning. Swimming- 1 hour 45 minutes total. All morning swims. Monday 40 minutes and Wednesday 30 minutes both with pull buoy for entire swim. Friday 35 minutes; warm up with buoy, 800 meters timed and a cool down. All things considered, I did really well with the timed 800. It is not a time I would ever be happy with, but give the circumstance, it is a good base for me to work up from. Strength training- 2 hours PT and an additional 20 minutes on arms. Abs challenge- 300 or so…another lame week. When I wasn’t training, I was totally on top of this…I must find a way to fit it back in!!! Cross training- Does Spring cleaning count??? Cause I found muscles I didn’t even know I had and they are sore!!! Weekly High: I am really proud of the time I spent in the pool! And my workout Saturday was awesome…I love days at the gym when I don’t feel rushed by the clock and I can just workout! Weekly Low: My job situation. The truth is, I am not even ready for a 5k at this point. I am looking towards a 5k in the middle of May and a 5-miler the first week in June. Then come July, I will begin training for the September half. Life: Don’t even get me started. It was a bad week! Healthy lungs. Tomorrow will be 15 months without a single cigarette!!! Time to heal…met up last week with a friend who I had a falling out with a few years ago; we made up a while ago but it was ackward a little. This time it was nice to hang out like old times again. …I got my RICE letter. RICE letter: A letter informing employees that their names and positions within the school will be discussed for demotion or termination. As of February 2007, the statute requires that the public be notified in advance of and be allowed the right to attend meetings of public bodies, and that all discussions and official actions, unless specifically exempted, take place in public. The intent of the Legislature, in enacting this law, was to eliminate secrecy in public affairs which would undermine the faith of the public in government. The statute allows the public to witness the deliberation, policy formation, and decision-making of public bodies. So basically, all I know right now is that my name is in the hat. Along with many others at my work (eleven in my building) who are teachers. We have already cut five employees (which is low in comparison to many schools) and now we have to cut more. The BOE meeting is next Thursday but they don’t have to give us answers until May 15th. Normally our administration is really good about not making us sweat things out, so hopefully we will know by next Friday or the following Monday at the latest. And get this…in my district, we presented a zero tax increase. ZERO!!! And the voters still said no. And you know why they said no??? Because Chris Christie told people that if their districts weren’t taking a pay freeze, do not pass the budget. And without bothering to educate themselves or even READ the notice that went home talking about their zero tax increase they came and voted no. Because they are convinced that by voting no, they are helping Chris Christie stick it to the man. What they do not realize, is that the wrong people are being punished. Bigger class sizes, lack of individual attention, no after school activities or sports and music & arts all taken away. You know who gets punished? The kids. This is happening all over NJ. In every school. I would like to send a big F.U. 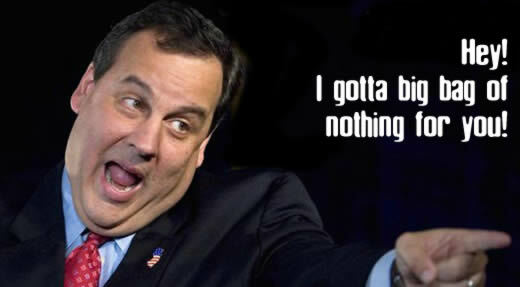 to Chris Christie! I really do not want this to be an open forum for any political battles. I respect both sides of the political spectrum when parties are informed and educated (this does not mean regurgitating FoxsNews) but this is not the place for those arguments. All I ask is that you keep your fingers crossed for me, my co-workers and the hundreds of others who are up against this same wall. Oh, and if you can read this…thank a teacher. Me: Whoa…I thought we were sharing a lane. Douchebag in Pool: I was here first. Me: Right, and if there was another lane in which I could swim, I would. But there isn’t. DIP: You know, some of us in here are training for triathlon (with a huge emphasis on triathlon) and need the pool. Me: Yes, I understand. I am one of those people. And then I swam off. And go figure, he got out of the pool about five minutes later. I would have…but some of us are training for triathlon!!! So there you have it, my motivation for this post. Know how to share a lane. You can either “split” a lane…each swimmer on their own side, or if there are more than two swimmers, you can use the circle format. This means everyone swims counter-clockwise on the right side of the lane. And don’t hog the lane like the moron in the aformentioned story. Know your ability. When determining which lane to enter when all lanes are full, look for swimmers who are at or about at your same ability. Don’t kid yourself about your skills. Be pass friendly. If you need to pass someone in the lane, simply tap their foot to let them know and then go around them on the left. If your foot is tapped to be passed, DO NOT speed up in an attempt to stay ahead. Swallow your pride and let them swimmer pass. Stop appropriately. Unless you are having an emergency, there is no reason to stop in the middle of a swim lap. All stopping should take place at the end of the lane and the stopped swimmer should tuck themselves into the corner of the lane so they do not get in the way of a turning swimmer. Do not aqua jog when sharing a lane. Nuff Said. Don’t pee in the pool. Do I even need to elaborate on this??? Shower first. The pool is not your personal bathtub. Don’t bring all your toys to every swim. Decide what you will work on for that swim and bring what you need. No reason to bring your whole toy box. Don’t be a drafter. If you are sharing a lane, don’t be the rude swimmer who constantly taps the swimmers foot but then doesn’t pass. Recognize that the gym pool is not a hang-out. It is not cute to wear your bikini to the gym pool and hang out on the steps. You look ridiculous. Do you have any tips or pet peeves to add? Stay tuned for Swimming 101 Part 3; pool toys and how to use them!